I posted a bunch of pictures from the show that opened Friday night, and let me echo what Amy did in the comments--if you're in south Florida, go by the Ritter Gallery on the FAU campus and see the whole collection, because it's incredible. I'm planning on working my way through a number of them over the next couple of weeks because I find them fascinating in the various ways in which they try to trigger an emotional reaction. The first one I'm going to talk about is interesting, however, because it doesn't really make much sense. 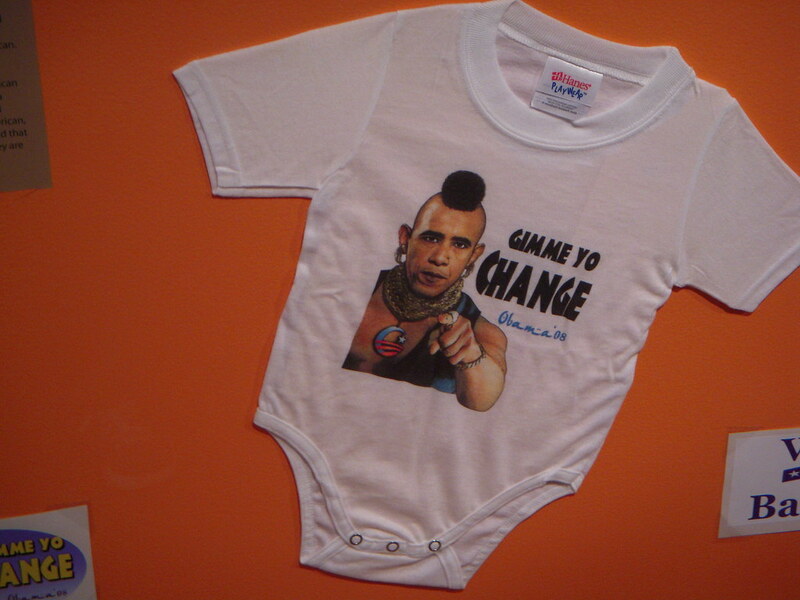 Okay, the fact that it's on a onesie is just messed up--anyone who would buy this and put it on their kid has serious issues, and I fear that the child is going to have serious issues with racial acceptance as he or she grows up. But look at that combination of images. Barack Obama as Mr. T is a nice beginning, especially with the Obama logo as the medallion, but what's with "Gimme Yo Change"? Mr. T was always the good guy on tv, the one who told kids to stay in school and treat their mothers right. (Trust me, you want to click on that link.) He wasn't a mugger. He was a little too corny to be truly threatening, even when he was Clubber Lang. I mean, if you ever said "I pity the fool" and then didn't immediately collapse into laughter, people would wonder what was wrong with you. So what kind of mind comes up with this idea. Well, I've got to figure it's someone who thinks all black people are inherently scary, and that Barack Obama and Mr. T have similar thoughts on the health care crisis. This next image is more along the lines of what I'd normally expect. Now this one is pretty well put together. 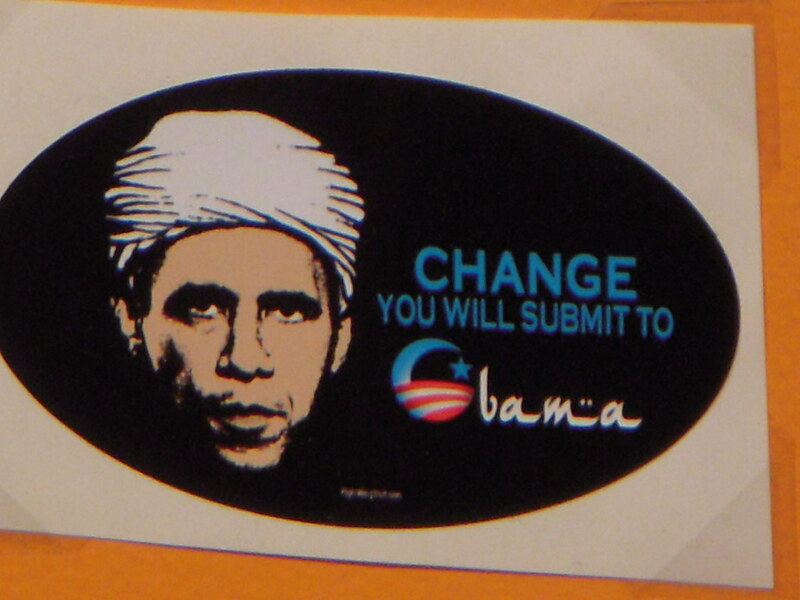 There's no question what it's trying to say--Obama is a Muslim, and he will force you to submit to his Muslim ways. Even the lettering is stylized to look Arabic, with the star and crescent incorporated into the Obama logo. It's clean and professional looking, unlike the Mr. T job above. Someone put some thought into this one. The turban is the one wrong move, since Arab Muslims wear keffiyehs, not turbans. It's the Sikhs who wear the turbans, and who were among the most brutalized in the US in the weeks after Sept. 11, 2001. The message it's sending is completely false, of course. Barack Obama isn't a Muslim, and even if he were, his election wouldn't somehow transform this country into a Muslim nation. In fact, it would be difficult for Obama to put the US more in thrall to the Middle East than the Bush administration has, or than a McCain/Palin administration would continue to. So the person who came up with this sticker has an irrational fear of Muslims and people with non-Anglo-Saxon-sounding names, and is willing to lie to try to convince others to stay away from Barack Obama. I'll do some of the Clinton images next. There's two distinct camps, it seems--those about her sexuality and those that wish violence on her, and there's a fair amount of overlap.